The Spartans build an early lead, then comeback late to defeat the previously undefeated Mustangs. In one of the more memorable scenes from the 1985 science fiction thriller "Mad Max Beyond Thunderdome," two men enter, one man leaves. 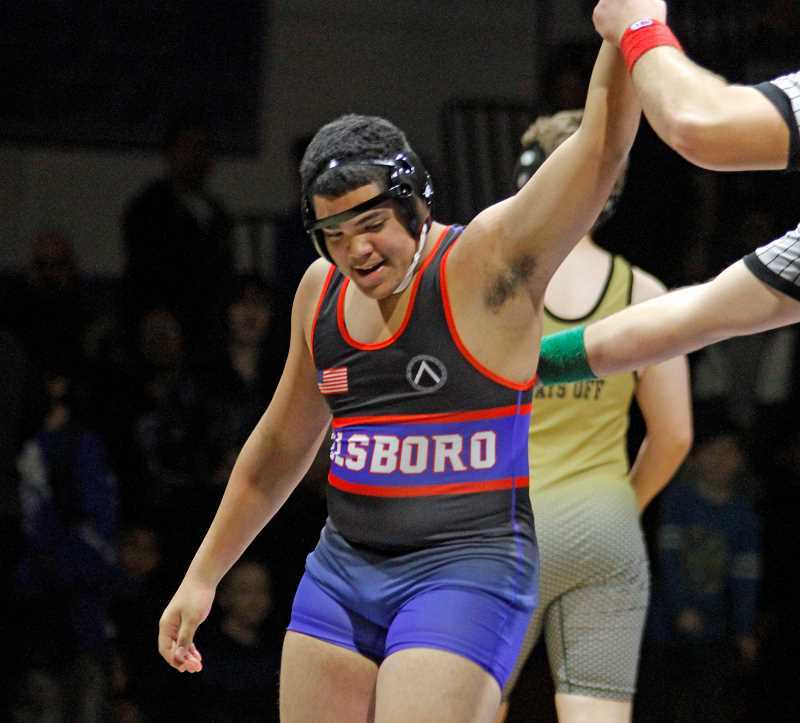 On Wednesday, it was Hillsboro that was the one wrestling team still standing at the end of a hard-fought Northwest Oregon Conference showdown with Milwaukie. Hillsboro and Milwaukie both entered Wednesday's final regular-season match with unblemished 5-0 league records, but the Spartans won eight of 14 bouts with five pins to score a 41-30 victory and clinch the NWOC dual meet championship at Hillsboro High School. "Milwaukie is tough and it was a tough match last year so we expected a tough one this year, and we got it," said Hillsboro head coach Stephen Moreno. "I'm proud of the way we fought. The thing I have to remind our kids is that here, wrestling is not an individual sport, it's a team sport. We had to rally and the kids stepped up." Milwaukie head coach Brian Duhrkoop agreed with much of what Moreno had to say, and too was proud of his kids, but also cited a couple unfortunate things that put his team at a disadvantage and in a tough spot when trying to turn the tide in tight matches like the one versus the Sparts. "We knew coming in it was going to be close with both of us 5-0, and we knew there would be a lot of strategy involved, hype with Senior Night, and five or six matches that could go either way, so it was intense from the start," Duhrkoop said. "We had a heavyweight quit on us, so not having a heavyweight and having to mix things up a bit at the end really hurt us. We also had a 152 pounder we lost to grades today, but all said and done they just outwrestled us and that showed in the end." Hillsboro's depth allowed for a cat-and-mouse game regarding the lineup, and one that paid off for the Spartans when things mattered most –- in the final two bouts. "We tried to put our best match-ups against their best match-ups," said Duhrkoop. "We knew it would come down to 220, and knew it would be close and if our right guy could wrestle their guy we'd have a chance there, but they had an opportunity to put in a different kid and it worked, so we have to hand it to them." Trailing 30-29 heading into the 220-pound bout, Hillsboro sent out freshman Darrius Walker against Milwaukie' sophomore Hunter Entrikin. Walker wasted little time spinning Entrikin to his back, winning by fall in 51 seconds. With the fall, the Sparts took a five-point lead, 35-30, and then put the dual away when heavyweight Trevor Schubmehl pinned Milwaukie's Austin Aune midway through their first round in the final match of the night. "What can I say about Darrius?" Moreno said. "He just turned 15 last week and he stepped up in a big moment. Then Trevor having to step up to heavyweight showed awesome leadership and we'll be looking for him to step up more." Hillsboro jumped on Milwaukie early, getting a decision from Ayana Medina at 106 pounds. Then following a fall by the Mustangs' Devin Greeley at 113, the Spartans reeled off three straight pins by Damon Chavez at 120, Ralphy Medina at 126, and Cole Siemon at 132 to take a 21-6 lead. The Mustangs fought back, getting a pin by Bryant Smith at 138 and a decision by Osric White at 145 to cut the lead to 21-15. Hillsboro answered with consecutive major decisions by Tanner Keffer at 152 and Nick Peterson at 160 to put the Sparts back in front by 14 points, 29-15. Milwaukie made one fine push as Jesse Salazar pinned Hillsboro's Bailey Hedrick in 1:03 at 170, Logan LaPine got a fall over Jesus Nunez in just 25 seconds at 182, and Peter Foulke scored an 8-6 decision over Christopher Day at 195, giving the Mustangs a precarious 30-29 lead with two bouts remaining. Unfortunately for the Mustangs and fortunately for Hillsboro, that's where things ended for Milwaukie, but despite the defeat, Duhrkoop was relatively pleased with their performance and spoke to a couple individual efforts he was proud of. "Peter Foulke won a big match and I was proud of our 113-pound guy, senior Devin Greeley," said the coach. "He's had a little bit of adversity in recent weeks, but got a pin and I thought wrestled really well. I was happy for him." The Milwaukie coach acknowledged some of his team's shortcomings, but is also optimistic about the Mustangs' potential at this week's two-day NWOC distrcit championships, beginnig Friday at Scappoose High School. "We're right there, we just need to keep believing," Duhrkoop said. "What kills us against Hillsboro is we don't have a lot of depth. They have more numbers than us and so on paper they're better in duals and tournaments, so we need to overcome a little bit next week. We just have to get better in many ways, one of which is finishing our shots." Meanwhile Hillsboro will take the momentum of a dual title to districts. But while excited and proud, Moreno was quick to point out -- in the wake of an ice water bath from his team -- it's a district title he really wants, and it's up to him and his individual wrestlers to bring it both mentally and physically for the team next week. "I feel good going into districts," Moreno said. "I have five seniors that are looking for state competition and it'd be nice to take 20 or 21 kids. Is it possible? Yes, but we'll see if everyone gets their head on straight and brings their best." The district championships will be held Friday and Saturday, Feb. 8-9, at Scappoose High School.